From time to time I do a check on my productivity. Partly it is a way to see how I'm doing. Partly it is curiousity. With all my health issues and not being able to weave over the summer, I started wondering if I had slipped on my skills. Or was I back up to speed? With the AVL and weaving software, I can easily count how many picks I weave in a session if I just keep track of the number of picks when I start and stop. So today I did that. In a 45 minute session I did about 1750 picks. Now this includes the bobbin changes, the shuttle jams (because, linen), backing up a couple of times because the weft loop pulled in too tight (because shuttle jams), and so on. So my actual weaving speed is higher than that. I have been estimating about 48 picks per minute. With all the stoppages, actual productivity was about 38 picks per minute, so it seems as though I'm pretty much back up to speed. As I've said before (and will no doubt say again) working efficiently is not hurrying. It is rather, a mental attitude first and foremost. The attitude that one's time is more precious than anything else, and then consciously working towards minimizing the amount of effort put into a physical activity. It is not something that happens overnight, nor all of a sudden. You have to work at it. The more often you do a physical skill (whatever that may be) the better you will get at it if you pay attention and constantly monitor your progress. "If I change this to that, does it make it better? Does it allow me to work more effectively with less strain?" It's the name of the game. It is rare that I take a day 'off'. Usually the reason I'm not working is because I'm too sick to get to the studio. But yesterday I didn't go to the studio at all. I had massage in the morning and as usual she asked if I was going to take the rest of the day 'easy'. With every intention of going to the studio I assured her that I would - fingers crossed behind my back, so to speak. But the day was nasty with near blizzard conditions and it was dark and dreary. I hadn't had a chance to visit with my neighbour for a while so instead of heading to the studio after lunch, I phoned and asked if she felt like a visit. She did, so I went over and we had a long visit getting caught up on the past month (or more) since I'd seen her last. By the time I got home it was 4 pm and I just didn't feel like doing anything...so I didn't. Today is a much nicer day, though. The snow stopped after dinner last night and the temperatures dropped bringing a lovely bright sun shiny day today. A quick trip to town for a few minor errands before the weekend and after lunch I fired up the AVL and finished off (sort of) the wound beige bobbins. There might just possibly be enough for one more towel, but I was anxious to see the brown weft, so said to heck with it, and began. The brown linen slub is just slightly thicker than the natural so I adjusted the pick count from 28 to 26 and I think it's good to go. It doesn't seem like 28 or 26 picks per inch would make a significant difference over 32, but it does. These are going to go so much more quickly than the singles 20 (or whatever it was) I have been using! Perhaps it is because I'm still tired. Perhaps it is because of the string of grey dreary days we have been having. 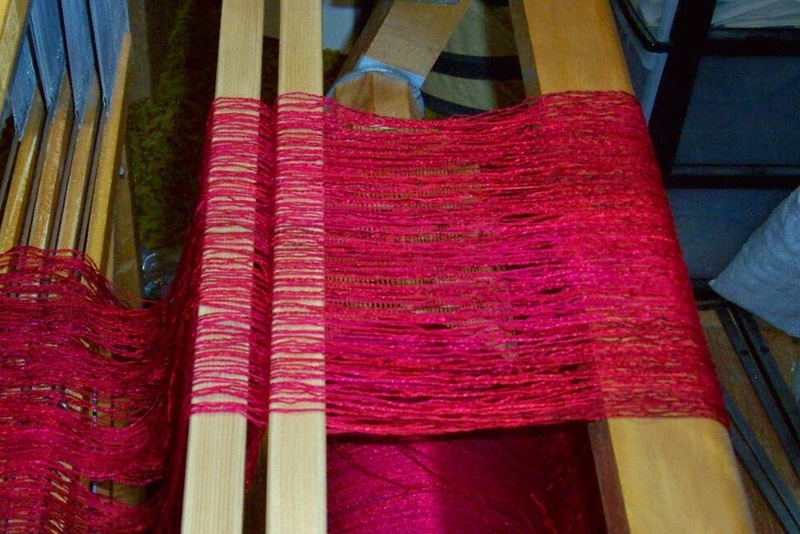 Perhaps it is because a similar coloured warp I wove earlier this year failed to sell at the craft fairs. Perhaps it is because these neutral beige shades really don't speak to me on a personal level. Whatever the reason, I'm finding myself rather uninspired by the results. Once I've finished weaving off the bobbins of the natural beige linen that are already wound, which should give me about 5 towels - and finished a small cone of the 3 of this yarn I have - I am going to switch to the dark brown. I'm not sure I'll like that any better, but it should be a lot more dramatic and visually dynamic. 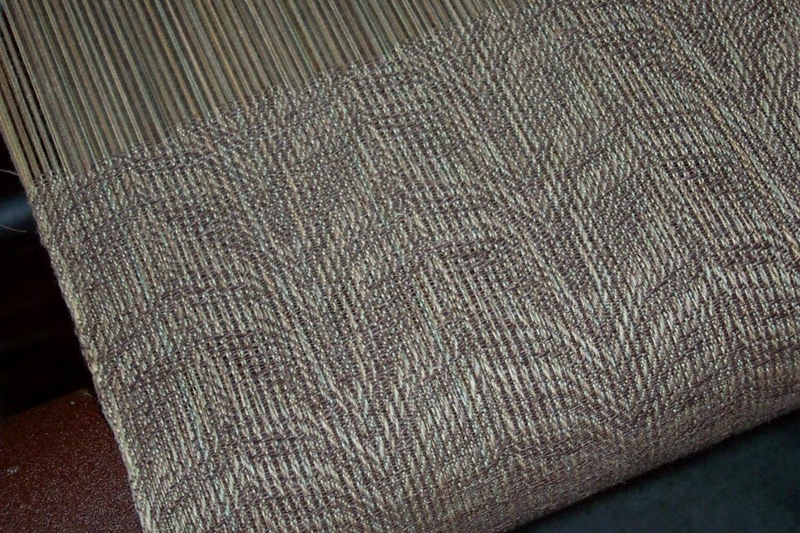 If there is still warp left when I've finished the brown, I will switch back to the natural. I'm quite sure that once wet finished the more neutral beige will look just fine. I just need something a little more visually stimulating right now. Not to mention the brown linen needs to be used up, too. In the meantime, we are waiting for the snow that has been predicted in a snow advisory. Supposedly 8-10+ inches by tomorrow morning. It still hasn't started snowing, so perhaps we'll get lucky and the storm will pass us by. 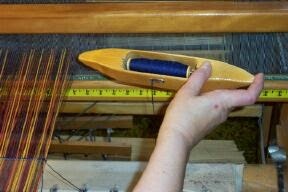 If not, I expect to spend some quality time at the loom tomorrow. Doug still hasn't unloaded the van, and may not be able to for a few days if the snow does dump on us. But once the boxes are emptied I will be selecting things to go on 'sale' like I did over the summer - iow, buy two (or more) items and get free shipping. why did I ever do it any other way" comments. learning has been done via books, DVD's and the internet. the filing cabinet where many other DVD's have been placed. beside me just to chat and enjoy a nice drink and some lovely food. a much less stressful place to be. Several people have sent emails with lovely comments. Belinda's arrived while we were on our trip round the craft fairs and I was beginning to feel very exhausted. What a lovely lift to read her words - and those of the people who have written reviews on Weaving Today, Craft Daily and Ravelry as well as the personal emails that have arrived over the summer and into the winter. No matter how much I love weaving, there are times - especially right now - when doing what needs to be done takes more energy than I really have. I told Doug last night that with all my health issues, I really can't do shows by myself any more and I am grateful beyond words that he is willing to do the (literal) heavy lifting. The good news is that I have a tentative surgical date. Hopefully sometime in January I will have the by-pass surgery and be back in fine form (other than all the other chronic issues I still have to deal with) by spring. Also while we were away I received another request to vend at the Alberta conference in May - this time I said yes, because I ought to be fully recovered by then. I should also be at Olds in June although I won't know for sure until spring. But it looks like those can go ahead without any problems. If, that is, my body decides to co-operate. After a truly horrible summer, I am once again (cautiously) optimistic about being able to have my brain and body back and functioning. But I doubt I will do much traveling to teach unless it is within driving distance. Even then I'm not sure I can any more manage 12 hour drives on my own. So I will probably attempt a trip to Seattle next summer to visit friends and see if I can manage on my own or not. Getting old is not for sissies! Art Market is halfway done. I'm glad. 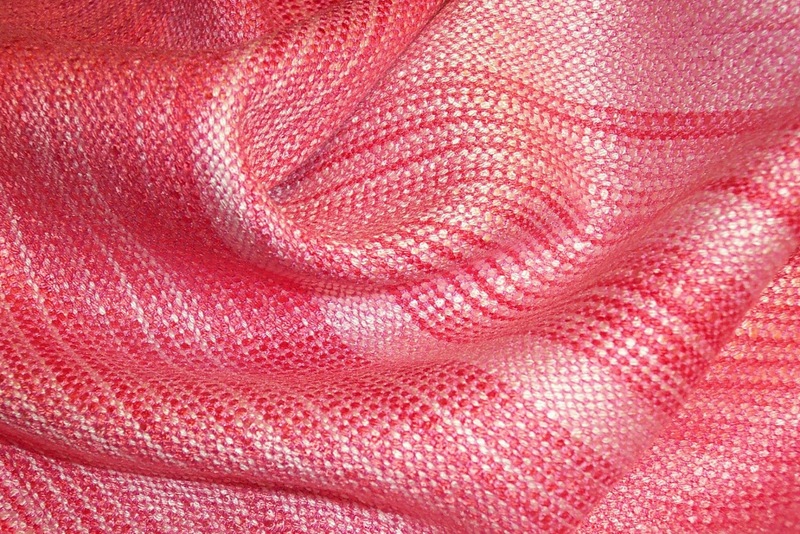 While I love weaving, I love even more that people pay me to take my textiles home. While chatting with another vendor at another show, we talked about how the selling was the hardest part of being a professional craftsperson. And then he summed it up by observing that if you don't sell what you make it might as well stay on the shelf as raw materials. Since the whole point is to earn an income by making things, said things have to sell in order to pay the bills, buy food, and, oh yes, buy more raw materials. She said it much more eloquently than I could, so if you are interested, do read her blog. It seems North American society has by and large lost an appreciation for the arts...unless someone soars to celebrity status. Nowadays they don't even have to be particularly talented, apparently, because technology can fix less than stellar performances. Most people are so removed from how things are made that they don't understand what goes into making textiles (or pottery, or whatever). And so craft fairs often turn into an educational experience as people ask if the vendors have actually made everything in the booth. Then they want to know how long it takes. I try not to get vexed at this question, but use it as an opportunity to explain how weaving works. And how much time is involved. An informed public has to be a more appreciative public. What most people don't understand is that making things and selling them means that you are in business. That means we have to pay attention to our budget, know how to schedule production, figure out legal requirements, design packaging or labels, hone our marketing skills. The fact that we enjoy the making of our product does not mean that we should be expected to work for nothing. Or 'exposure'. Having spent about 40 years learning my craft, I have achieved a pretty high level of skill. In any other field I would be making a whole lot more money and have a tidy pension plan. Instead I chose to be self employed for the satisfaction of directing my own life the way I wanted it. Am I complaining? Perhaps a little. But would I have changed my life in order to have more security? No. That doesn't mean that I will any longer work for 'exposure', though. At last, we are done. Took longer today than usual, for some reason. Maybe because we are getting tired? Maybe because Doug returned the van to the hotel when it was empty. Maybe because we use extra lights at this show to get more light on the product on the shelves. Maybe all of the above? We are finally back at the hotel having a toes up time. We will probably go back to the bar and grill just down the block for dinner later. The prices were good and the food is decent. And I don't need anything fancy. We were very lucky with the weather on the drive from Vancouver to Calgary. The road was dry, it didn't precipitate. Things could have been a lot more...interesting. We stopped for the night, not terribly late, and when I went to enter the room, realized it was already occupied. I don't think anyone was actually in the room, but I rapidly backed out and closed the door. We were able to get another room and didn't have to share. What we didn't realize is that the town of Golden, BC is undergoing some major construction. 24/7, no less. Needless to say we didn't have a very restful night. We moseyed on to Calgary, arriving at our hotel along with a fleet of emergency vehicles. There was some sort of natural gas issue. We left the van in the hotel parking lot and found a coffee shop to wait while they figured it out. Apparently the vent exhaust was getting sucked into the fresh air intake. Fortunately it didn't take long to get sorted out but with one thing and another, we never did get lunch. I really hope that is the extent of the...interesting...unless it is mega sales at Art Market. Friday night an individual came in and purchased this amazing tapestry and will donate it to a facility for sick children. So heart warming to hear this!!! The artist, Sola Feidler, 78 years young, is already planning her next tapestry. 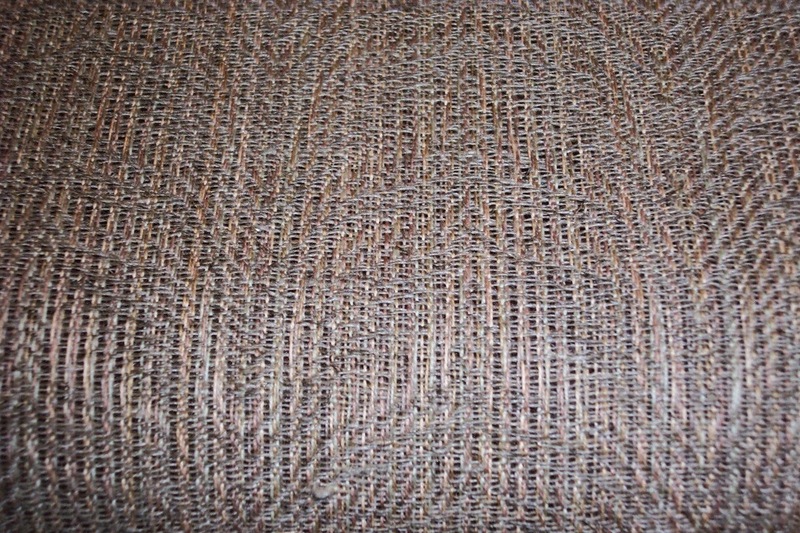 This one took about five years to weave (if I heard correctly). Just finished Anne Murrays bio and started The Innovators. Book is already packed and I don't recall the authors name. 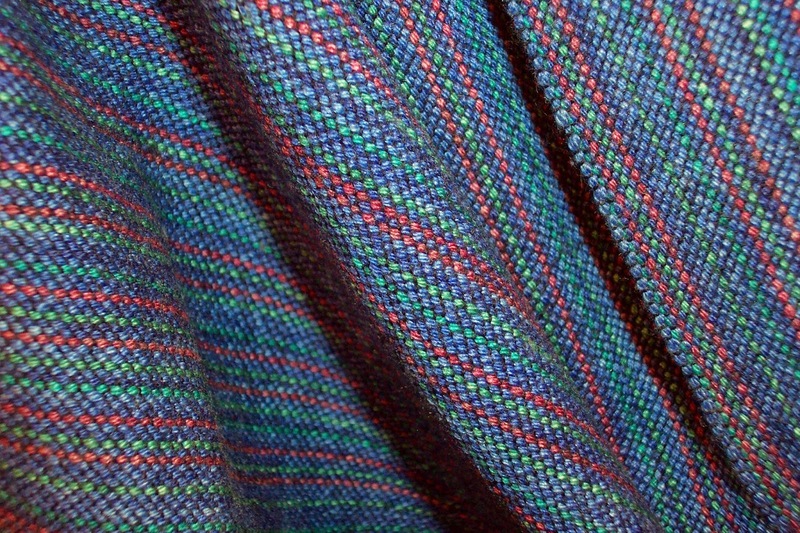 Meg issued a challenge to see if people could capture textiles in a photograph. The Wet Coast is showing off with a lovely sunny day. We slept in this morning. I think we were both pretty tired. Of course, not setting the alarm properly may have had something to do with it not going off? But we got to the hall without too much delay and by 1 pm we were pretty much done setting up. No photos today. The wifi connection at the hotel keeps dropping out and did not want to accept the photo I took from the hotel window. I'm not entirely happy with the way the booth looks...but I never am and people seem to buy anyway. We have spent the last couple of days getting ready to leave for Circle Craft. It seems as though we are packing everything - booth, electrical stuff, inventory, our clothing plus food. We will - hopefully - have a kitchenette in Vancouver so we will be able to make breakfast and lunch. That will help with the trip expenses. It has rained pretty much all day and it is black as can be outside. I'm really hoping the weather forecast for dry weather in the morning is accurate! Of course the weather can change - repeatedly - during a nearly 500 mile journey. 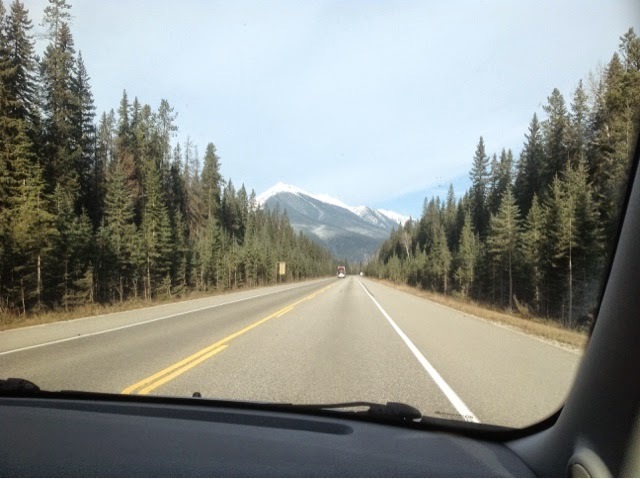 And then there is the trip from Vancouver to Calgary - a two day drive - through not one but several mountain ranges. Keep fingers crossed for good driving conditions! In years past, I would scramble like a mad woman trying to get one more, one more, one more warp woven off in time for the shows. After 6 years of dealing with health issues (and the fatigue from the undiagnosed issues for several years before that) I think I am finally learning that there comes a time when it really is too late to squeeze just one more, one more, one more thing into the schedule. In spite of wanting to have these red scarves ready for this year, it isn't going to happen. And I find myself strangely content with that concept. They say with age comes wisdom. Perhaps now I'm old enough to be wise? It took me a while to figure out what TBT meant - what can I say, I'm a bit slow on the uptake at times. A few months ago I joined a Facebook 'page' called Hell Yeah, Prince George. It is a page for celebrating what is right and good about our town. After decades of having nothing but negative reports made in the media about the town in which I was born and grew up, it's been great having a more positive spin put on the place - and the people who live here. I have another picture of the siblings and grandfather (grandmother died when dad was 10) but I haven't scanned that one yet. These old time photos are so tiny I have to scan them at a pretty high resolution and it takes forever - even when I do it right! The boys made their own violins and guitars, and mandolins for the girls. There were 8 siblings, 5 boys and 3 girls. The eldest died very young - he got pneumonia and although he made it to town (it was about a 20 mile journey and he wound up walking much of the way until someone picked him up and delivered him to the hospital) they couldn't do anything for him. No anti-biotics in those days. Yes, those 'good old days' weren't so good much of the time. 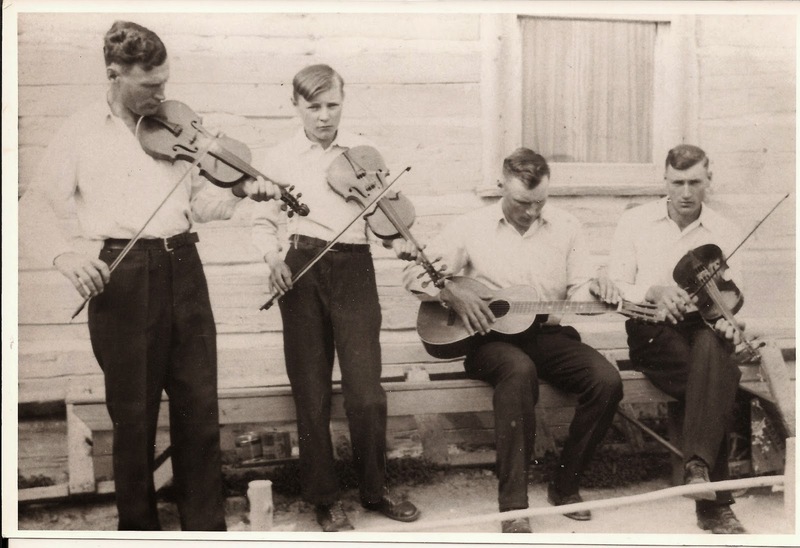 The boys formed a band and played at dances in the area. They farmed, they hired themselves out as haying crew, they panned gold from the Fraser River. They did everything they could to survive in a harsh and unforgiving environment. One of the stories I've heard was that uncle Emil (far right) saved up enough money to buy an accordion from the Eaton's catalogue. One night after playing a dance at a nearby community downriver from the farm, a couple of friends convinced Emil to stay, have a few beer and visit. He said he would miss his ride, but they assured him they would get him home. Colour isn't quite right in this photo but about as close as I can come. 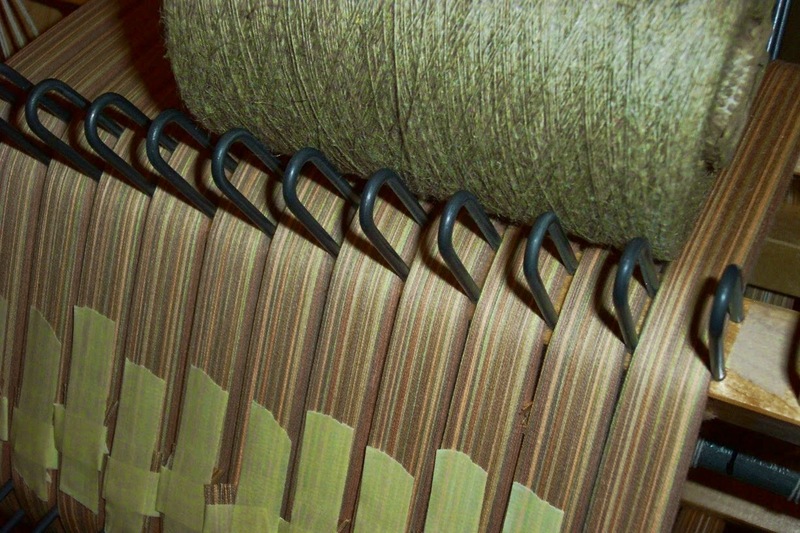 The linen (the cone on the top) is actually more brown and less green looking. With the aim of reducing my stash of fine linen, the next warp is another 2/16 cotton and the weft is a fairly coarse/hairy tow linen, probably a singles 12. 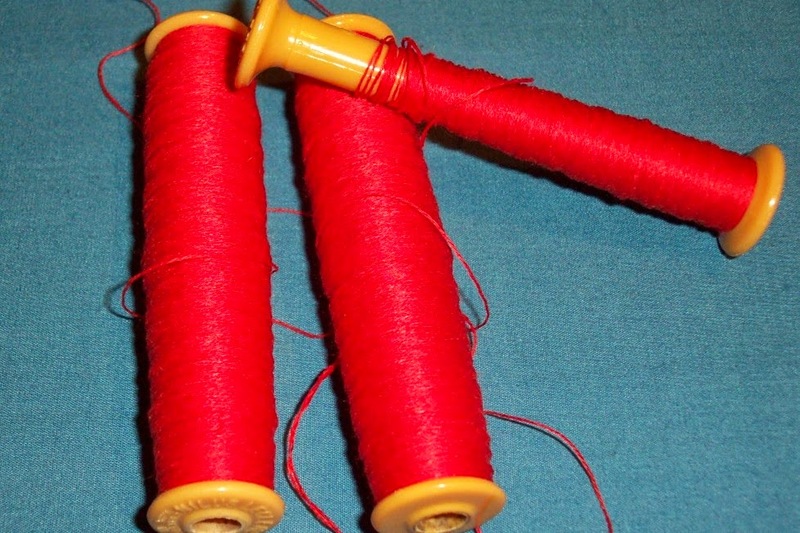 Most of Lynn's yarn did not have identifying info with it so a lot of the time it's just my best guess. I have about 6 pounds of this tow linen so I put a 30 yard warp on - well, I suppose I ought to say that I'm putting a 30 yard warp on because I'm only half way done winding. 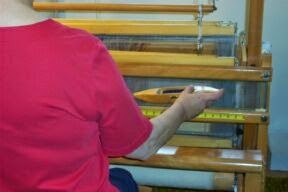 Then I'll see how much of the linen gets used up and go up or down on the next warp depending on how much is left. 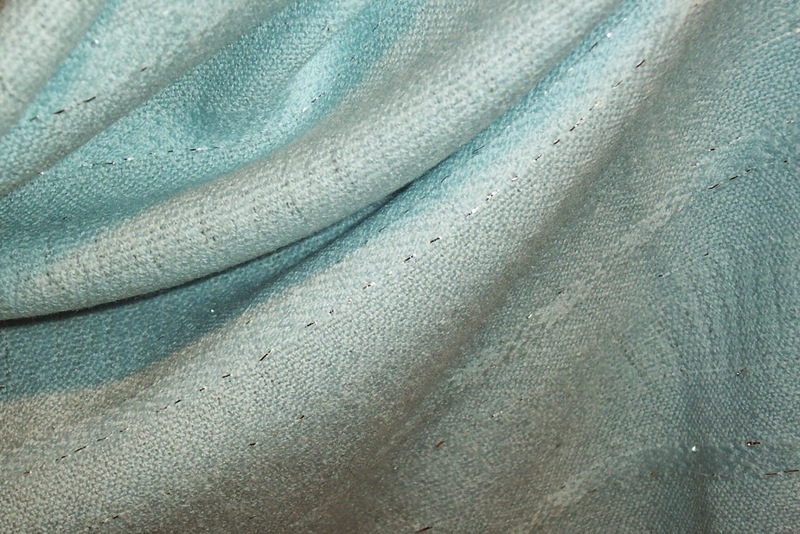 The threading will probably be a fairly simple twill with some straight runs and some advancing areas. The kind of 'wood' colour of the warp is inspiring me to play with a draft that might sort of look like wood grain when it's done. Still have to play with the draft and fit it to the number of ends I'm winding. 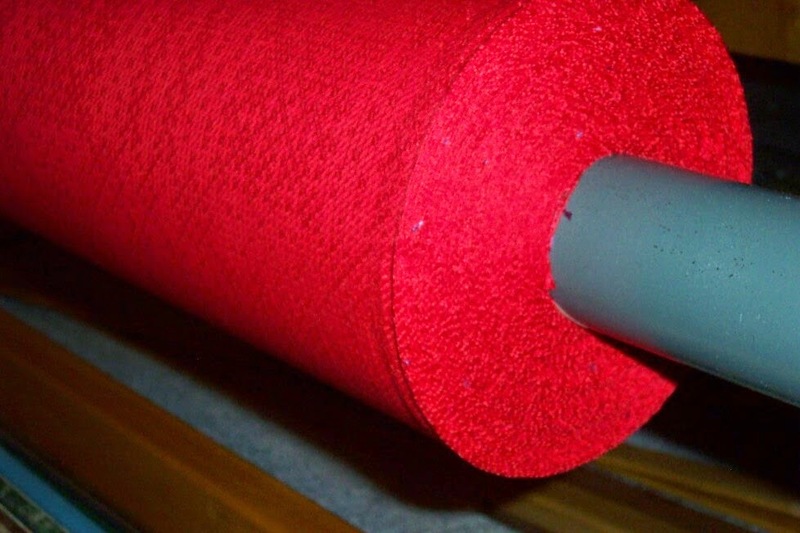 There was enough warp for one more towel - but I decided I'd had enough. Plus if I'm going to get them cut/serged and wet finished, I needed to be done. We have 6 days between the two shows and there is a possibility that I can get these towels ready to be hemmed during quiet times at the next show. Who knows, maybe I can even sell some of them? They would make great festive cloths for the coming holiday season. 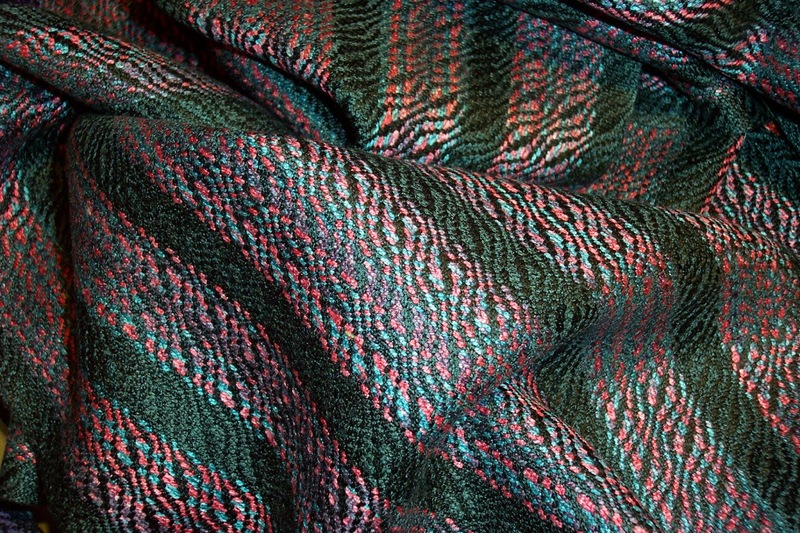 The design is a twill block version of Young Lover's Knot traditional overshot pattern. The red on red makes them look quite elegant. 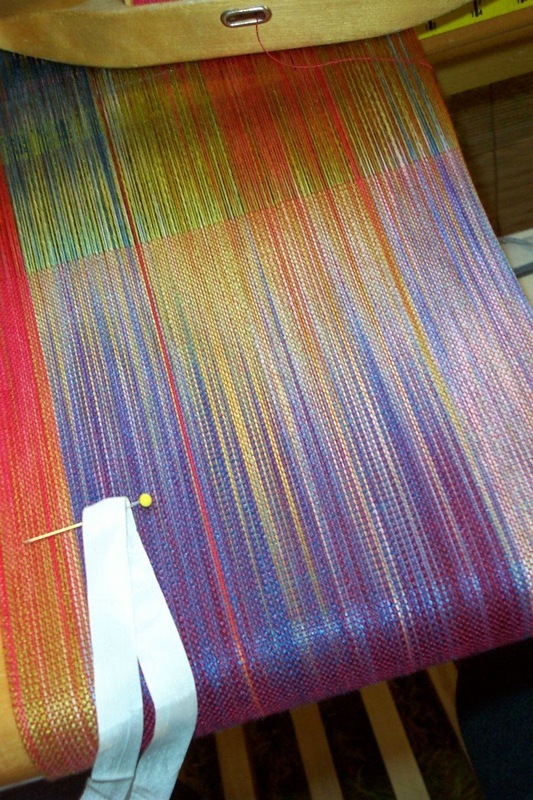 Loom waste on this warp is 2 yards, but since I wound 36 yards, I'm not feeling terribly guilty about 'wasting' it.